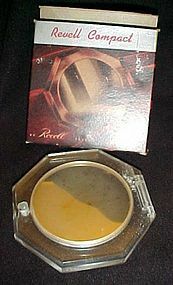 Extra VINTAGE RARE AVON TO A WILD ROSE Cream lotion 4 FL. OZ. 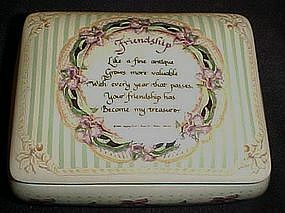 Full and in the original box, though it may to be too old to actually use. 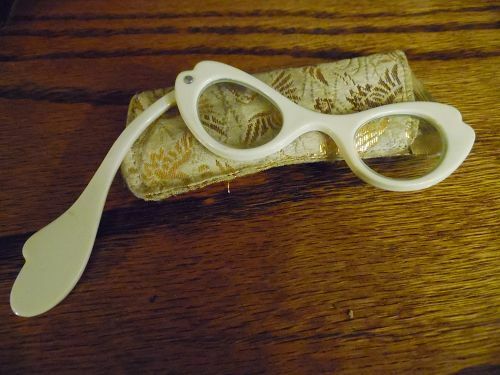 I've listed this as "extra" vintage due to the white milk glass container and the fact that the "Good Housekeeping" seal of approval is printed on the box which I haven't seen on Avon products in some time. Wonderful condition, and box is also pretty nice for the age nice. 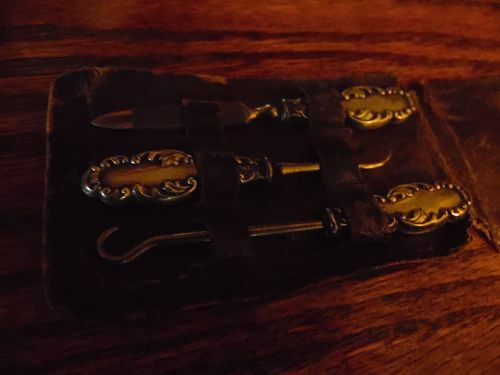 Antique Victorian era manicure shoe button set is made with ornate sterling silver handles. Two manucure tools and a shoe button hook. I believe these were for a little girl because they are small with each piece measuring almost 3". They are in the original little leather case which is not in real good condition, but has kept the set nice over the past 100+ years. 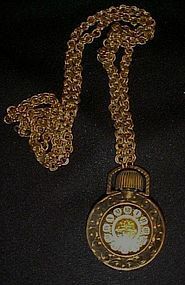 Each piece marked STERLING (STAR SYMBOL) H&H. Which is the mark of Hamilton & Hamilton Providence RI 1896-1915. This lovely lady looks to be from the 40's era. Pretty pink flowing dress makes up the area you would use for soap, pins, trinkets or jewelry. Her pretty blue bonnet and gloves contrast nicely with her dress, THe gold accents make her look very elegant. Measures about 4" tall. Her skirt area is approx 5" wide. She is PERFECT with no chips or cracks. 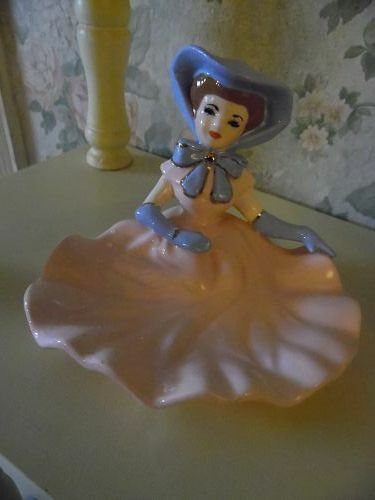 She has no sticker or markings, so not sure if she was made by a company or hand made by a novice. 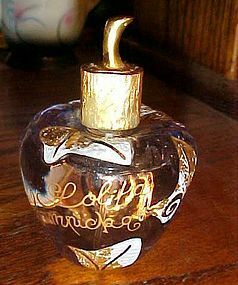 Pretty vintage pressed glass perfume bottle and stopper. Grounf glass where the stopper fits into the bottle for a nice fit. 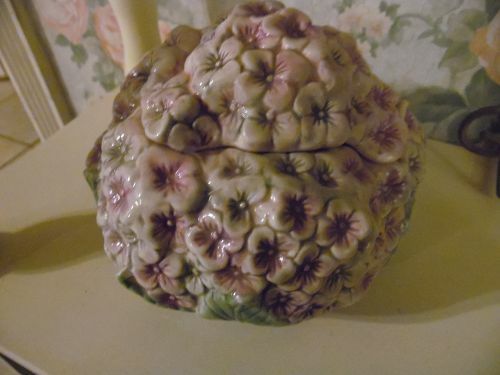 Measures 6 1/2" tall and has no chips cracks or damages. 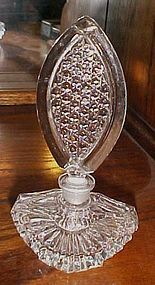 This large lovely perfume atomizer bottle measures 6 1/2" tall and is a deep amethyst purple cased in clear glass. THis art glass vanity bottle would hold quite a bit of your favorite perfume. 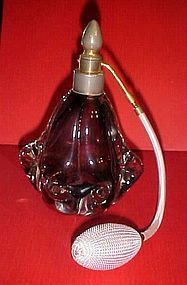 Bulb is in excellent working condition, Top screws off to fill with your favorite fragrance. Perfect condition. Ground glass bottom has some wear scratches because it is old and has been used. This is a lovely find. THick and heavy, but gorgeous!! 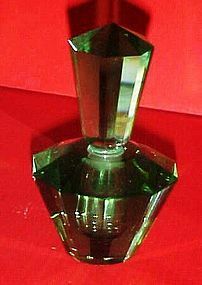 Beautiful vintage emerald green, 10 sided, faceted perfume bottle for your vanity. This bottle is beautiful and in lovely shape with no damages to the bottle or stopper. 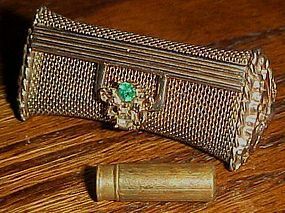 Ground glass stopper so the fit is nice and air tight for your perfume. Measures 4 1/4" tall. 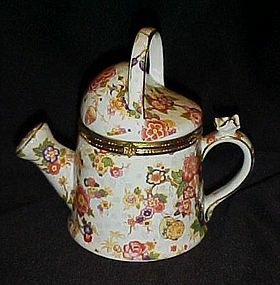 Pretty old fashioned porcelain watering can with all over chintz florals, and gold trim that matches the metal edges and hinge, Pretty applied rose on the handle. Made by Formalatties. 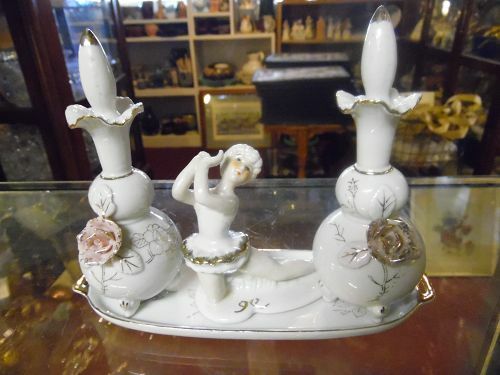 Measures 5 5/8" tall and is in excellent condition with no damages.